Ran across some E. polychroma (Cushion Spurge) starting its fall turn into a blazing, reddish dazzler, and couldn’t figure out why I hadn’t written up this genus prior. There are many, many spurge varieties native to most parts of the world, and luckily, a few of the nicest varieties have proven to be hardy in the north. Varieties of Euphorbia are not usually on our list as we wade through our early years of gardening. Flowers are rather insignificant, so you think, what’s the point? But it is at that point when we figure out that foliage, not flowers, is the key to a beautiful garden, that spurge becomes essential. You grow it for the fabulous form and foliage, plus eye-catching bracts (brightly colored leaves that resemble flowers). Long-lived when grown in light, well-drained soil, Euphorbia is guaranteed to delight. E. corollata is a delicate native blooming in white as it reaches three feet in height, and is often used after killing off your third attempt at Baby’s Breath (Gypsophila). E. polychroma is the most common to the northern trade, makes the most impact, and is a good place to start. 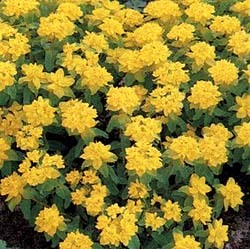 Reaches 18″ to 24″ in height, yellow bracts offset perfectly by creamy pale-green leaves. E. griffithii is now proven hardy to Zone 4 and will be seen more often in the trade. Similar in form but twice as tall as E. corollata, it sports red-veined leaves and blazing orange bracts. Spurges prefer full sun but will perform admirably in lightest shade. They like light soil (sandy loam is perfect) and will die by June in clay/heavy soils. Figure average moisture requirements, though after a year or two they tolerate dry spells. Divide in early spring after three to four years; a woody, central crown will develop and the plant will appear to be dying out in the center, which it is. But be careful. You’ll want to completely wash all soil from the root system after taking the plant up, then cut the thick, fleshy roots with a sharp knife, ensuring that each division has several eyes and ample roots. I’m done telling people where to plant plants and in conjunction with what other plants. That’s for you to figure out, so you develop as a gardener. All varieties listed are hardy to Zone 4, but also worth a try in Zone 3, providing good soil, fertilizer a few times a season, and winter mulch.